Whether we're aware of it or not, our beliefs affect a great many things—what we value, what we want to accomplish, who we strive to become, how we see things, how we interact with others and our surroundings, how we interpret what happens around us and to us, and whether we become successful or not. 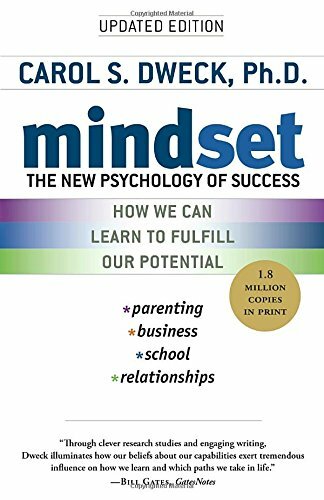 In the bestselling book, Mindset: The New Psychology of Success, Stanford University psychologist Carol S. Dweck, Ph.D. takes her decades-long research on mindset or a person's set of beliefs and explains how this greatly influences the way we lead our lives. Individuals with a fixed mindset believe that their intelligence, abilities, qualities, and talents are, well, fixed while those with the growth mindset believe that these can be developed. If you're looking to understand how these mindsets play out in different aspects of your life and how you can change your limiting beliefs to become a more motivated and effective leader, parent, coach, business owner, teacher, or partner, then this book is for you. Just as people have both good and bad qualities, we are all a mixture of fixed and growth mindsets, each employed and more evident at different times. Because our mindset reflects how we interpret things, how we learn, what choices we make, what kind of persons we become, and which path we take in life, it's important to take the proactive approach and cultivate the growth mindset. Instead of focusing on labels and stereotypes, we can strive to learn and develop. Instead of being persons who blame, put down, and judge others, we can be the ones who teach, encourage, and empower others. Both these mindsets become evident and play out differently in various aspects of life. In terms of business and leadership, CEOs with a fixed mindset choose to surround themselves with people who only agree with them and put them up on a pedestal. Different opinions, reasonable risk-taking, and addressing inefficiencies aren't encouraged and therefore, no longterm growth is possible. In terms of school and learning, students with fixed mindsets believe that they're incapable of becoming smart (or smarter). They're afraid to take on new challenges and they doubt their ability to learn from mistakes. Likewise, teachers with the fixed mindset label students as "dumb" or "smart" and by doing so, limit the children's potential and discourage them from learning. In terms of relationships, three things are at play here—your qualities, your partner's qualities, and the relationships itself—and sadly, each can exhibit the fixed mindset. A one-time rejection from a significant other becomes a lifelong label of feeling you're unlovable. A partner who places importance on different things from what you deem valuable is misconstrued as being incompatible. A relationship that requires work and communication is interpreted as "not meant to be." In terms of sports, society today values effortless success over earned accomplishment and talk of being a "natural" is all too common. But if you take a look at the great athletes of our time—Michael Jordan, Tiger Woods, Michael Phelps, Mia Hamm, etc.—you'll notice that it took a lot more than their abilities. They've reached the top of their fields through discipline, hard work, perseverance, strategy, and many more. In terms of parenting, parents with fixed mindsets may be cultivating the fixed mindset in their children by labeling them and praising them, "You're so smart!" or "You're so pretty!" instead of acknowledging the connection between their effort, process, and outcome. The first is to embrace your fixed mindset. Like I mentioned in #1, we are a mixture of fixed and growth mindsets and so it’s important to acknowledge both so that you can begin to change. The second step is to identify what triggers the fixed mindset. Whether it's challenges, distractions, problems, encounters, or something else, we must become aware of what gets this mindset going in the first place. For the third step, the author encourages us to create a persona of this fixed mindset (and even name it if you want! ), then understand how it affects us—our interactions, responses, and actions. The fourth and final step is to educate this persona and work with it to bring about change. It’s important to note that while changing your mindset may take a whole lot of time and effort, it is possible. The author emphasizes the fact that whenever we practice and learn new things, the connections in our brains actually multiply and get stronger. This is literally how the brain grows. Lastly, growth isn’t about learning a few tricks and hacks and expecting to be successful overnight. If we are to take control of the way we lead our lives, then we should constantly evaluate the way we think, see, and interpret things and choose to use this information to transform our lives, not limit it. At some point in the book, the author mentions an amusing fact: Nobody laughs at babies when they can't walk or talk immediately and this is because we know that they just haven’t learned how to yet. And so, the same principle should be applied to us adults because we simply haven't learned how to do a lot of things yet. Instead of labeling, judging, or limiting ourselves (and others), we should be open to challenges, learning from our mistakes, and ultimately, letting go of our fixed mindset in order to foster the growth mindset. Share in the comments below: What areas of your life have you noticed the fixed mindset more evident? How can you approach these areas using the growth mindset instead? If you've read this book, what are your three takeaways? Since one of the best ways to improve ourselves is to commit to continuous learning, this post is part of the blog mini-series called 3 Takeaways where I share three insights from thought-provoking books on a monthly basis.